Many people don't look back on their high school experience with a whole lot of fondness. It can be a difficult time for lot of people, but at least most high schoolers don't have to be afraid to use the bathroom at school. This was the case for three transgender teens in the West Linn-Wilsonville School District before they transferred to Arts and Technology High School in Wilsonville. Danny Anton, a sophomore, transferred to Art Tech at the start of this school year, while freshman Liam Betts and sophomore Miles Olson both transferred in the middle of this school year. While life as a transgender teen is still anything but easy, things got a lot better for these three once they arrived at Art Tech. "Once I got here, everyone was immediately accepting and no one really questioned it," Olson said. "One person who I had known before used my dead name (the name a person went by before they came out as transgender) because they didn't know I was trans but once they figured it out, they immediately respected me, which was nice to have compared to my old school where people were terrible." 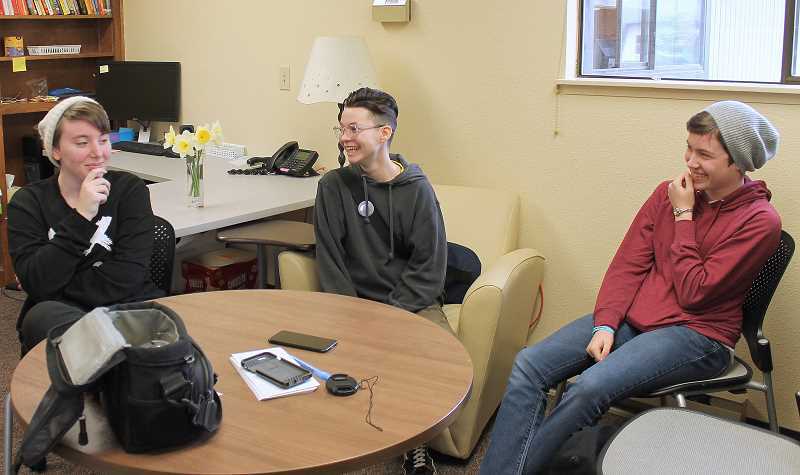 Anton, Olson and Betts each said that with an enrollment around 100 students, the small community at Art Tech feels like a family, which they all appreciate because even their own families don't always feel that way. Olson remembers thinking he was different from a young age. At five, he tried asking his friends what they would think if he were a boy. Being 5 years old and not understanding what it meant to be trans, they laughed at the question. At 5, Olson himself didn't understand it either and carried on wondering where he belonged. A few years later, Olson tried talking to his family about it. "I came out as non-binary at first just to see how they would react and they didn't react badly; they just didn't take me seriously," Olson said. "And then I came out as male and they didn't take me seriously for about six months and now they want me on hormones as soon as possible." Olson said things seemed to shift in his family after a conversation he had with his grandma. "I was in the car with my grandma and she started crying and I said, 'Grandma what's wrong?' and she said 'I just don't understand why God had to put you through this.' And I'm personally not religious but I was like, 'Maybe He wants me on this journey.' And now she's like 'I'll fight you if you don't support trans people.'" Anton said he wishes his family could be that supportive. "My parents are like 'Oh cool, you're grounded for your life.' It's been five years now and they're still like 'It's still a phase.' I don't think it's a phase if it's been going on for five years, since middle school," Anton said. Betts only came out this past year and said his parents have struggled to fully understand but mostly support who he is. No matter their situation at home, all three are grateful to have found a family at Art Tech. "People (at Art Tech) are not going to be like 'I hate you' cause we're going to fight back like a family here," Anton said. Betts agreed that there is very little tolerance for bullying among the students at Art Tech. Students will hold each other accountable for their unkind words or actions, he said. For these three, this is a stark difference from Wilsonville High School, where harassment was a serious issue for them. "One thing I did experience at my last school was bullying and harassment. People would physically harm me and it wasn't a good time," Olson said. "Counselors would ask constantly ask for names and I wouldn't tell them because I don't want them to get suspended or expelled from here." But simple things like being able to use whichever bathroom suits them make attending Art Tech much more manageable for the teens. "I didn't even use public bathroom until I came here because I felt comfortable here," Betts said. Attending a welcoming school like Art Tech doesn't make all of these students' challenges disappear. They still face battles ranging from anxiety to body dysphoria. "I hate going in public places because I'm not confident at all and I'm not comfortable presenting myself this way," Olson said. "Sometimes it's with close friends too. I just won't be feeling great and won't want to be around them at all. Some days I just have really bad dysphoria where I hate my body." But sometimes the tiniest moments can make this anxiety disappear for a second. Olson said the feeling he gets when he passes for male without someone suspecting he's trans is the greatest feeling in the world.